We just dropped off 2 embellished journal covers at Baron’s. 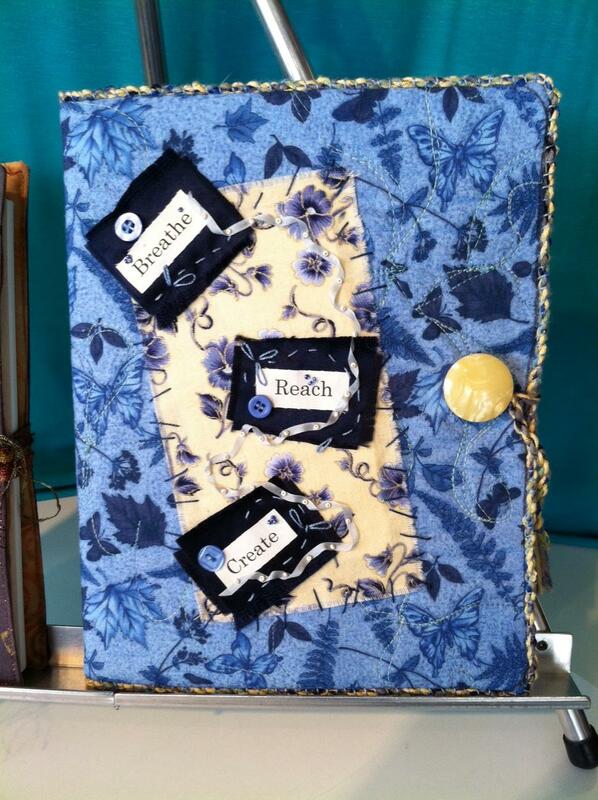 “How to create an embellished/collaged fabric journal cover” Workshop is scheduled for Saturday March 16 and repeated Tuesday March 19. Call Baron’s to register or for details. This cover fits a composition book approximately 9 inches high by 7 1/2 inches wide. This is the size we will be making in class. We will provide the composition books in the purchased supply kit. 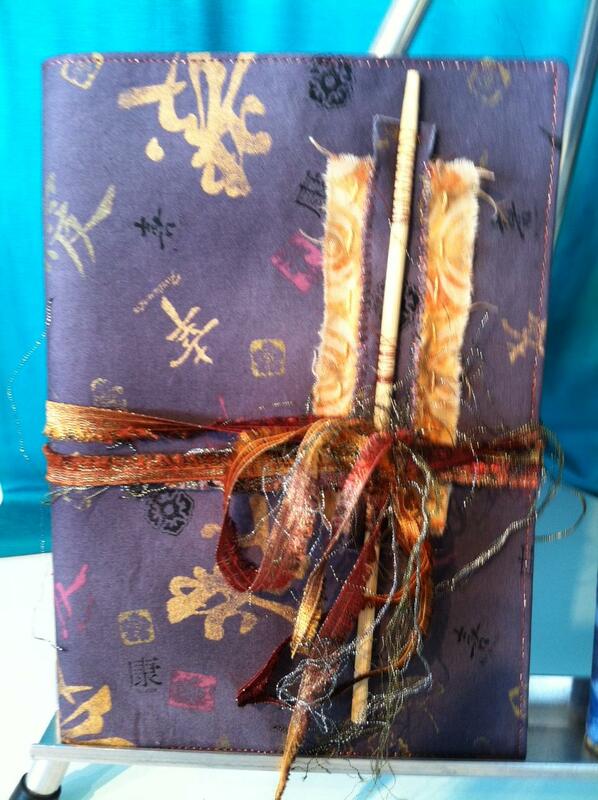 This cover was adapted to fit a spiral bound art journal measuring approximately 5 1/2 inches by 8 inches. We will provide guidelines for adapting directions for other sizes. 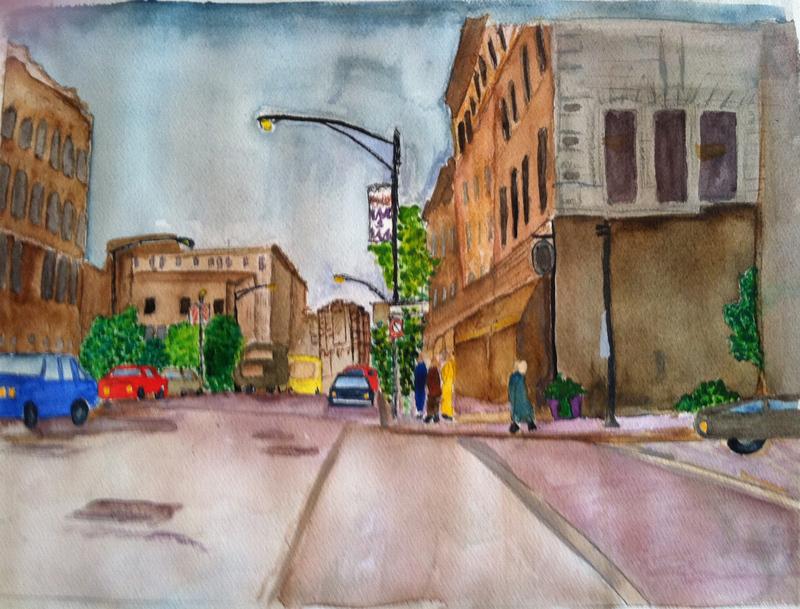 About a year ago I signed up for a watercolor class at the local Y – not being an avid watercolor fan especially, but being very eager to take a ‘formal’ class in one of the Fine Arts; to learn art technique and principles from that perspective. Well, I was not only presented with all kinds of wonderful information, I became fascinated with using this form of paint. I love the transparency of watercolor and the ability to subtly layer color upon color. It is so exciting to put down a swipe of color on a wet surface and to coax it gently in the direction you want. The color has a mind of its own and often does more interesting and exciting things than your original idea. I’ve worked on various kinds of projects to learn different skills – most of these are still unfinished. Some will remain unfinished – some I am still working on. This street scene is probably my favorite completed piece thus far. Just got this in the mail from WordPress.. Some pretty nice numbers there – thanks to all of you. I’m appreciative of each and every one of you who takes the time to see what’s going on here and especially when you leave a like or comment. What kind of art quilt techniques are you interested in? What kind of sewing/quilting tools would you like to have reviewed? Are you interested in seeing my experiments with fabric and surface design? caution: some of them turn out UGLY, lol. Let me know what you want to see more of and I’ll do my very best to comply. Have a wonderful, safe, healthy and happy 2013! Thanks for all your support in 2012. 600 people reached the top of Mt. Everest in 2012. This blog got about 4,300 views in 2012. If every person who reached the top of Mt. Everest viewed this blog, it would have taken 7 years to get that many views. As the year is winding down I’m busy getting my act ready to take on the road for 2013. A new workshop being offered is Celebration Art Cards. This is one of my favorite things – creating small mixed media pieces – combining colors and textures as I go to achieve a special look. 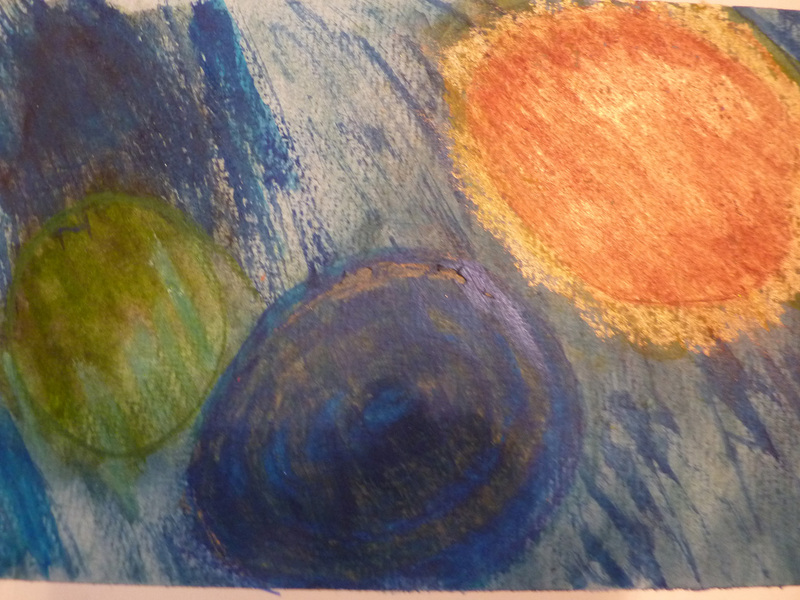 It’s all about color – movement – mood – and most of all letting those creative forces loose and having FUN!! Workshop being offered at Baron’s Sewing Center Friday January 18: 4 PM until 7 PM. I can say two things for sure: Teaching teenagers art quilting fundamentals is FUN !!! and… Teaching teenagers art quilting techniques is EXHAUSTING !!! I just finished up 3 days of workshops at Baron’s Sewing Center in Woodland Hills with a group of bright and talented young women. They were eager to learn and to put their new skills into action. 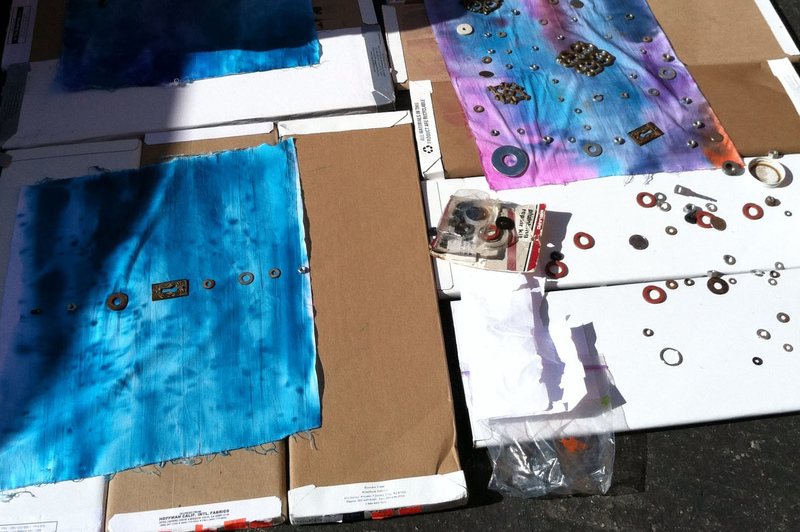 We started off with a lesson in Sun printing using Dynaflow Paint from Jacquard. The plan was that the pieces would dry in the sun while we went on to the next topic. Well, Betsy and I knew they’d enjoy the process but hadn’t realized that this technique would be the hit of the day! All they wanted to do was to Sun Print!!! And I must say some amazing work was produced by these budding artists. 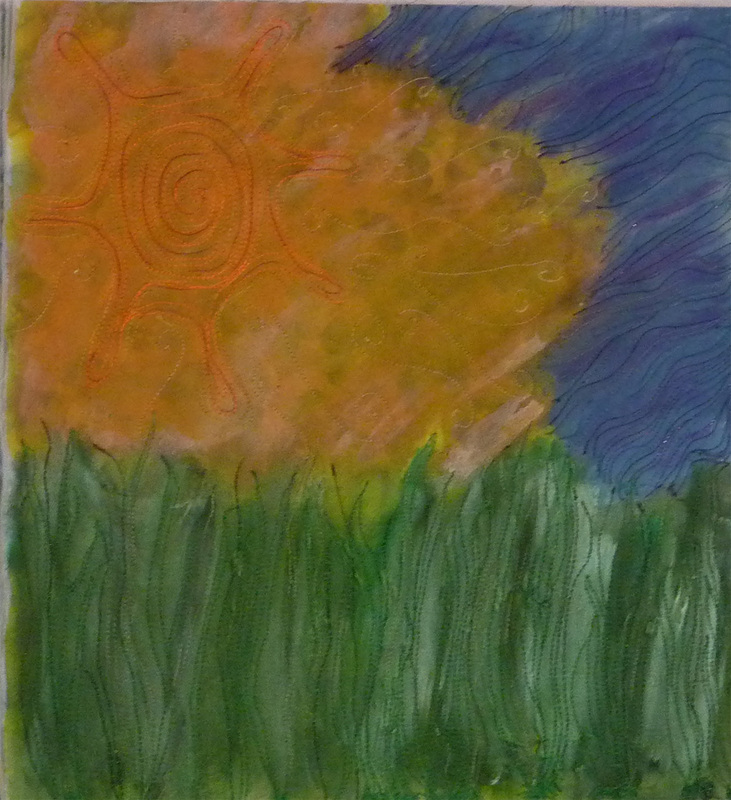 (I will be putting a Sun Printing Tutorial on my Blog shortly for all to enjoy). The girls used all kinds of things to create their patterns – plumbing washers, nuts, bolts, coins of all sized, keys, decorative flashings from keyholes – sequin waste and decorative cutouts of their own design. The session on painting techniques continued with stencilling paint on fabric and using rubber stamps to apply acrylic paint as well as pigment or dye ink from stamp pads. Day Two started with a unanimous request for MORE SUN PRINTING !! We were glad to oblige but made sure we got to the new stuff as well. Our students learned the use of Fusible web to apply designs to their quilt tops and how to assemble the layers that would give them a foundation for quilting their pieces. It was exciting and gratifying to see how quickly these girls caught on to the concept of free motion quilting. And although mastery of this technique takes many hours we saw some commendable first timer results here. Day Three commenced with yet more requests for painting. I promised they could do that after we talked about a couple of other things. I reminded them how excited they had been with the idea of applying glitter to their quilts and took a few minutes to demonstrate how easy it is to do that. They had all decided that they wanted to turn their quilted panels into pillows. 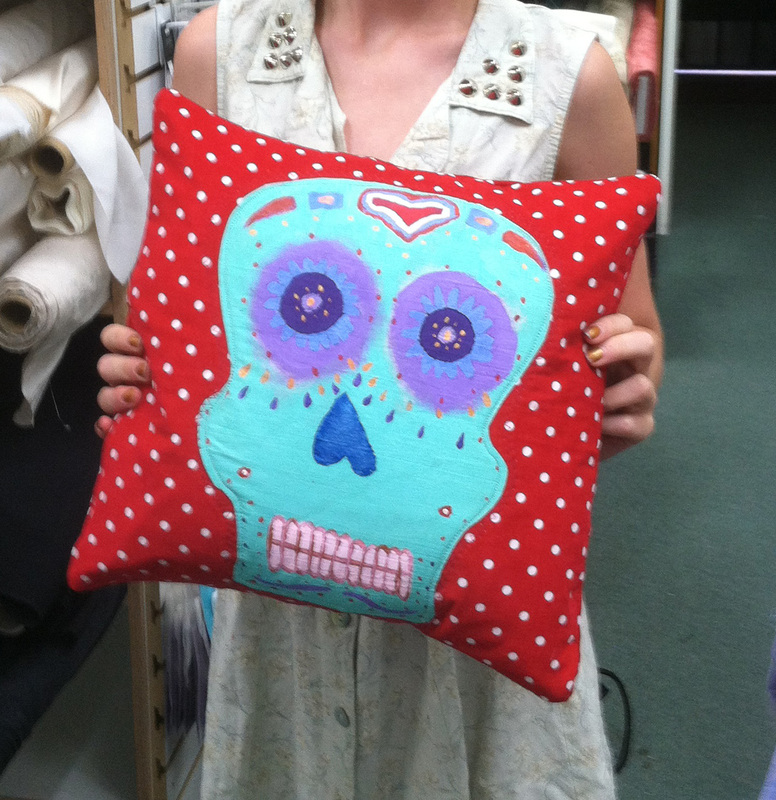 So I proceeded to show them how to assemble a removable pillow cover using the pieces they had just created. 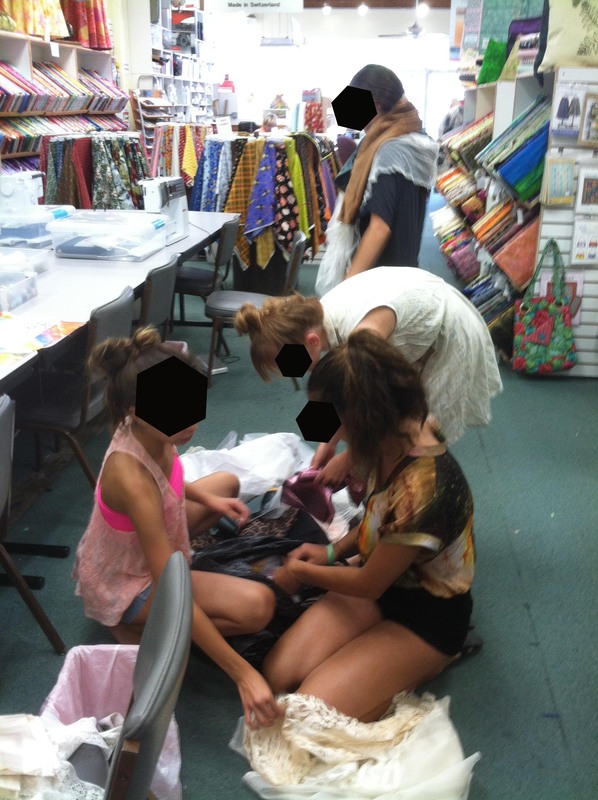 Here they are digging into the scrap bag looking for suitable pillow back fabric. Here is some of the work produced by this talented bunch. This is one of the best overviews of art journaling that I’ve read. It gives you some ideas of what supplies are needed and how to go about putting together some simple pages to get started. 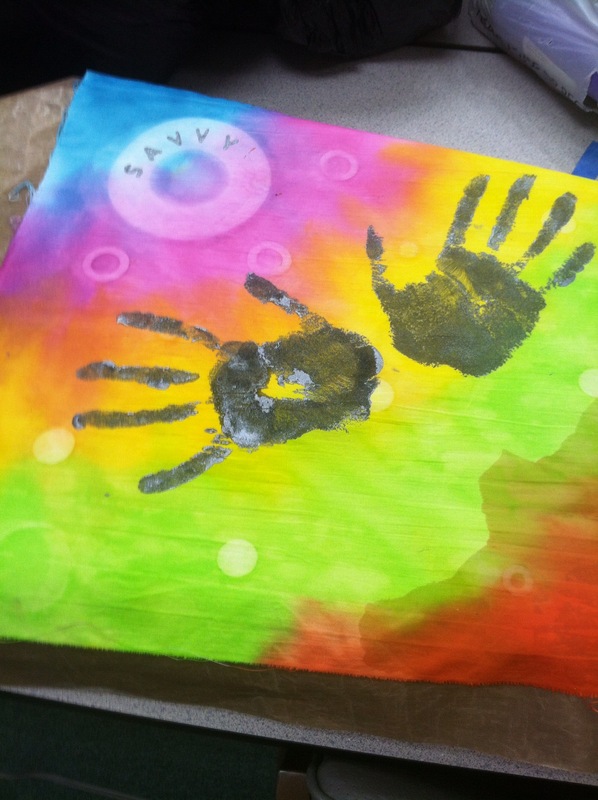 It is from the Art Camp for Women blog. 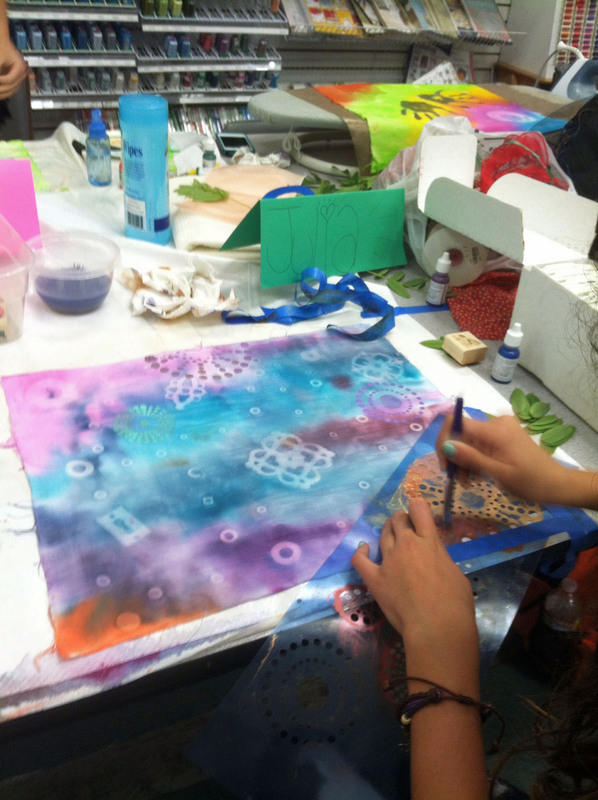 Art Journaling Basics to Get You Started | Art Camp for Women. I’ve been using Ink Stamp Pads forever. Remember as kids when you’d get hold of an old stamp and stamp pad and brand everything in sight including the back of your hands? Many years later I tackled scrap-booking then journaling – again making use of those tempting rubber stamps and lovely inky pads. In those days it was pretty straightforward. If the color called my name I used the pad and didn’t care if it was Dye Ink, Pigment Ink, Solvent, Archival, or whatever. Now with art quilting there’s more to the selection and more risk in selecting the wrong type of pad. It’s got to transfer cleanly to a very porous surface. And of course you don’t want fading. You may also be concerned about the image staying put AND crisp and clear after washing or if you’re planning to use wet media over the image. I have NOT included the effects of washing on these samples and will do something on that another time. Oh I got so confused!!! Everywhere you look – known and trusted online sites/blogs, manufacturers’ sites or craft shop advice sites you get someone else’s opinion. And often these opinions are at odds with one another. So I decided to take matters into my own hands and go back into my mad scientist mode. I lined up ALL the different types of ink stamp pads that I had on hand, chose a rubber stamp that would print well (not too much detail and deeply carved stamp ridges) on fabric and went to work. 2. One by one I inked up the stamps, stamped the fabric, and recorded what was used. 3. In a couple of instances I also documented the Surface that I stamped on to see if that made a significant difference. For instance whether it was a hard surface or a cushiony one – including batting. 4. After making sure all impressions were completely dry I pressed with a hot iron. NOTE: Because I’m going to be using these in Art Quilts I did not wash the fabric again after stamping it. So this is NOT a test for washability, simply a comparison of how well the inks did visually on the fabric. I was looking for vibrancy, clarity and crisp edges. Here are the photos of my first go-round. 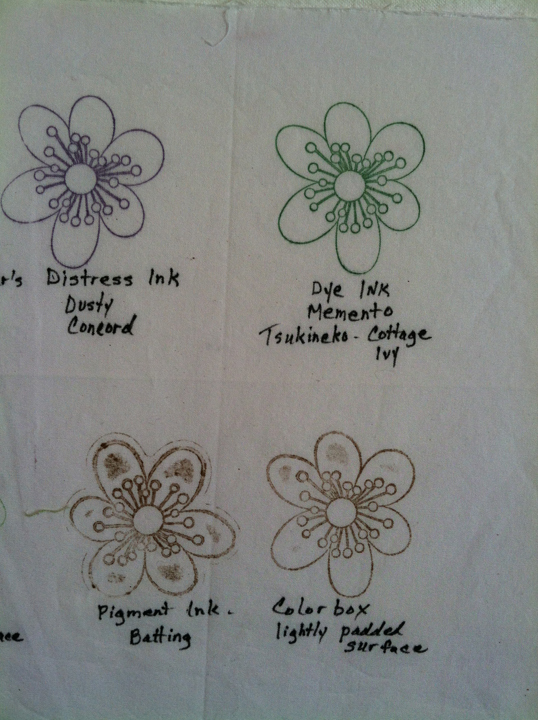 In my opinion the best performers were the dye inks from the Recollections and Memento (Tsukineko) lines. I stamped with Recollections with and without batting under the muslin and definitely got a crisper edge without the batting. The solvent ink from Staz-on and Archival Dye Ink from Ranger were both excellent. The downside with both is that they are limited in color choice and are quite pricey. The pigment ink from Colorbox left a smudgy outline. I tried it on a lightly padded surface, over batting and on a hard surface. The hard surface was best but still not as distinct as the Dye Inks. The pigment ink from Versacraft was acceptable but not as crisp as Memento. *A note about Versacraft: it is widely accepted as a good choice for fabric stamping as it has proven to stay put after washing. So if that’s your need it’s definitely a consideration. 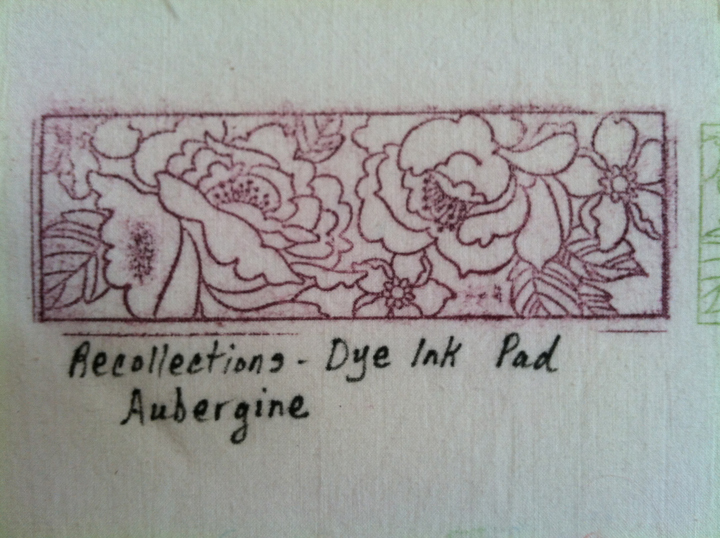 I further tested the Dye Ink from Recollections with a larger stamp to see if I could repeat the good outcome. I am partial to this particular pad because of availability and lower cost. However I haven’t seen it in a wide array of colors. I retested the Memento as well. Both were excellent. Memento has a broad choice of colors available. 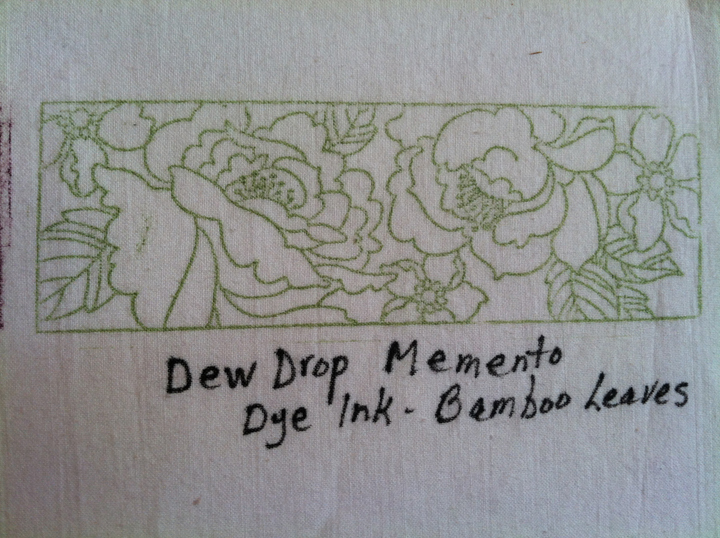 It’s a little pricey in the larger stamp pad but is available in a smaller more economical Dew Drop size. 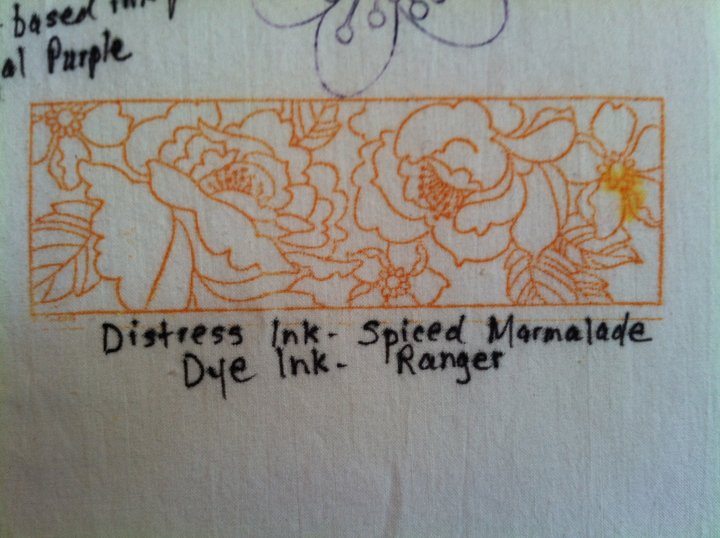 And here is the Dye Ink from Ranger (Distress Ink) This comes in a wonderful array of colors. Next I will be testing my collection of brush markers with stamps to see how they perform on fabric so stay tuned. Please pretty please leave me a comment – especially if you have had experience with any of these and would like to add your observations. That would be grand and thank you!! The Haiku Art prompt word for January was Exhilaration. Sometimes all it takes to experience these feelings is to step outside on a sunny day. For the art work that I was preparing to go with this haiku – I didn’t want to be too structured. I wanted to indicate an almost childlike feeling of exhilaration with my composition and color choices. At the same time, as a developing art quilter, I wanted to incorporate a couple of new techniques and see “what if”? 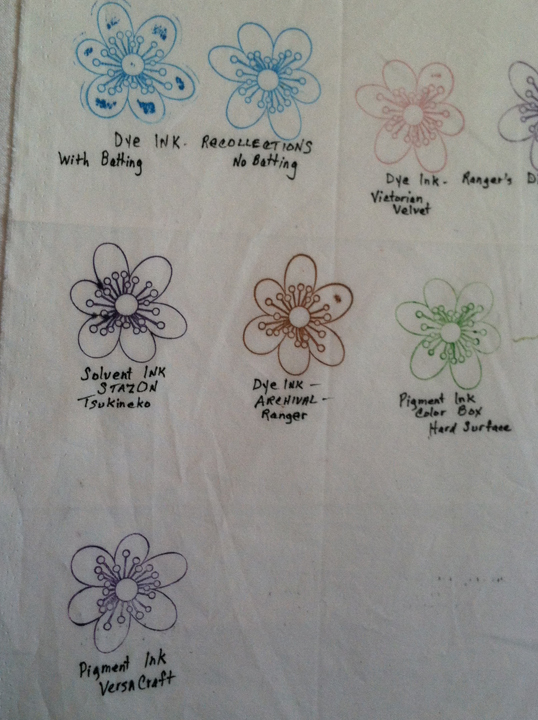 First off I used a “blah” pastel print in lieu of plain muslin as my base. I didn’t mind that it partly “showed through” – just felt it added some interest. I felt that color was of first importance in this piece – so before doing anything else I painted my background using acrylic paint. 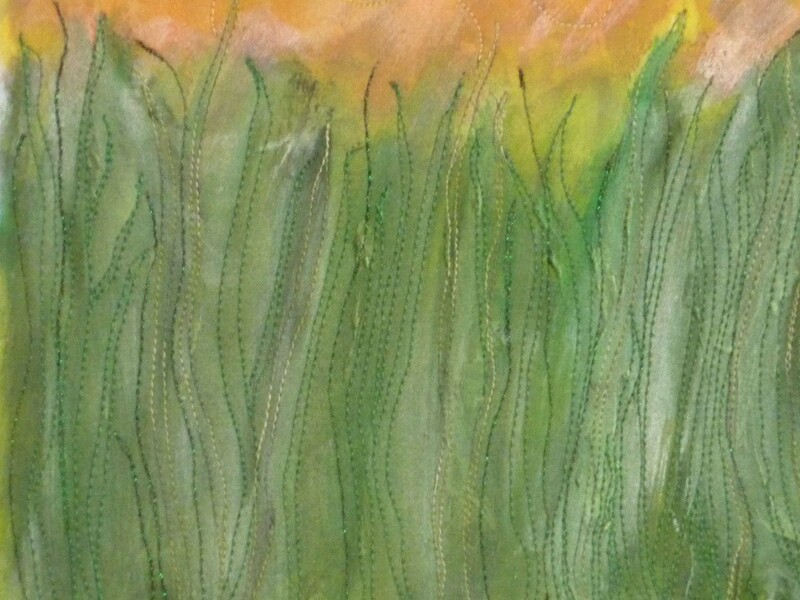 In order to add some texture to the piece I used some Golden Light Molding Paste to parts of the grassy area. I quilted the piece extensively with heavy thread.